Every semester Sagi, Tom and Ivan teach an honors class in identity design at SVA. As a part of the course the students do real-world work for a real client using the firm's methodology. 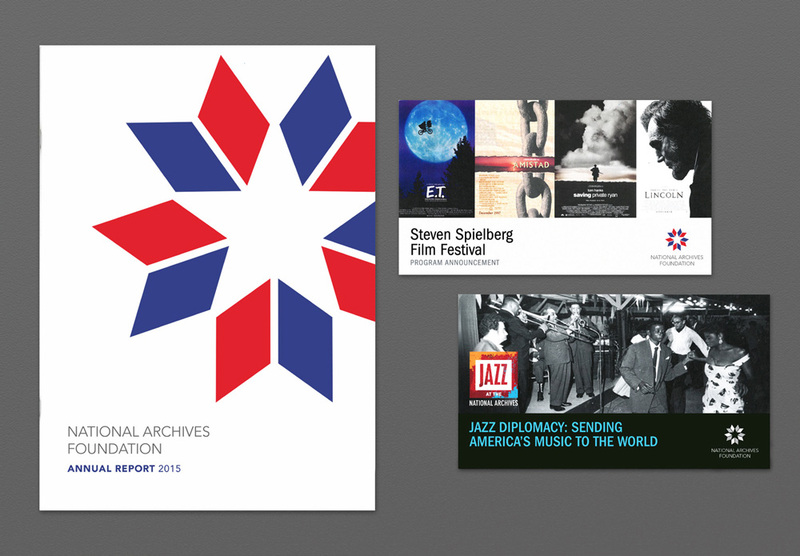 This year the students worked on new identity designs for the National Archives Foundation […]. They chose a mark designed by a student named Joy Im. […] "The refresh of our brand marks an important milestone and the start of a new era for the National Archives Foundation," said Foundation Executive Director Patrick M. Madden. "We were thrilled with the opportunity to work with SVA students as part of our commitment to cultivate a greater understanding of the American journey." The old logo was respectable; nothing fancy, nothing terrible. The new logo, although done by students, clearly has the minimalist approach of Chermayeff & Geismar & Haviv and, in this case, it works quite nicely to communicate the American-ness and archival-ness of the foundation by using what could be read as open books that form a star in the negative space using a red, white, and blue color palette. It doesn't get more straightforward than that. The typography is neutral and fairly forgettable but it wouldn't add much to make it stand out more. Overall, it's a very appropriate logo for the organization it represents. (Est. 1992) \"The National Archives Foundation is an independent nonprofit that increases public awareness of the National Archives, inspires a deeper appreciation of our country's heritage, and encourages citizen engagement in our democracy. The Foundation generates financial and creative support for National Archives exhibitions, public programs, and educational initiatives, introducing America's records to people around the U.S. and the world.\"